Season's Givings Blog Hop | Nail Polish Shaped Cards & a Giveaway! Hello everyone! Happy New Year!!!!! I am SO happy/excited/thrilled to be participating in this year's Seasons Givings blog hop! There are a ton of fabulous designers participating and a TON of giveaways (at least one on every single blog!) so settle in with a cup of whatever and keep reading! I want to say THANK YOU to all of you who watch my videos, read my blog and/or follow me on social media. If you're new here - welcome! This is my happy little corner of the interwebs where I share all my card making posts and videos and do what I love. Of course I have a giveaway as well! Info on that and how to enter is at the end of the post! Since I'm in a New Year sparkle/shine sort of a mood it felt fitting to pull out my Honey Bee Nail Polish Bottle wafer dies and Shine On stamp set and coordinating dies and make some cards! These were really fun and really easy to make. I used several Tonic Glitter and Mirror/Satin card stocks for the "polish" and for the lids and bows. The sentiments were gold heat embossed onto black card stock, and the bows and sentiments were adhered with foam adhesive. I finished off the inside of the cards with another sentiment from the Shine On set and that was it! Isn't this amazing!! SO much inspiration and so many giveaways!! I have this fun set of brand new Honey Bee Nail Polish stamps and dies to give to one of you! Happy (almost) New Year!! I have yet another card and video for y'all (when I said I was back and catching up I meant it LOL!) - also stay tuned as I'm part of a HUGE blog hop tomorrow morning to ring in the New Year. There will be TONS of inspiration and TONS of giveaways!! I pulled out the new-to-me Stinkin' Cute stamp set from Simon Says Stamp - this set came out years ago and I just recently added it to my collection - the name says it all LOL! To frame my little critter I used the new All My Heart stencil and masked off the inner heart potion then inked Simon's Rosie Cheeks over the small hearts with a Picket Fence Studios blending brush. The skunk and hearts were stamped onto Neenah Classic Crest 80lb card stock with Simon's Intense Black Ink then coloured in with Copic Markers. I used Crystal Glaze on the hearts, and added Black Glaze to the skunks eyes and nose. I finished off the inside of the card with sentiments from Simon's Uplifting Sentiments set and stamped the hearts from the Stinkin Cute set and that was it! Hey everyone! I'm back with another card and video - and while I've included it in my Valentine series this one can definitely be for any occasion/time during the year. I used Simon's new Damask Background stamp and stamped it onto white card stock using Sea Glass ink - SO soft and pretty. I didn't want it to be too bright or busy since I was adding the Outline Clustered Leaves die cuts over it as well as the sentiment. I die cut the Outline Clustered Leaves from vellum and from white glitter paper and layered them on my card front. For the sentiment I ran three pieces of Sea Glass card stock through my little 3" Xyron machine to put adhesive on the back, die cut them with the Thinking of You wafer die then stacked them together. The heat embossed sentiment is from the Love Messages stamp set and it was die cut with one of the Nested Banners wafer dies before being popped up with foam tape. I used another sentiment from the Love Messages stamp set and stamped it onto the inside of the card with Audrey Blue ink and that was it! Yay!! As promised - now that I've completed all my haul and unboxing etc etc videos and feel (a little more) caught up - time to make some cards! And since Valentine's Day is coming up lets get those started shall we? I combined some brand new Simon Says Stamp and CZ Design products with my oldie-but-goodie Picture Book Love Bear wafer die to make this cute card! I blended some Rose Apple ink over one of the new Heart Layers stencils, then over that used a smaller stencil from the pack with Tonic's Novo Moonstone Glimmer Paste. I combined the CZ Design Peace & Love dies with SSS Glitter paper - so sparkly/shimmery in real life. I also used a bit of the glitter paper for the heart on the bear - just a cute little extra. I finished off the inside of the card by blending the Rose Apple ink a bit lighter over the stencil then added a heat embossed sentiment (from the CZ Design Simple Sentiments 2 stamp set) and that was it! This includes Simon's fabulous Picture Book Dies too!!! <-------click! Simon Says Stamp Wafer Die SALE!! 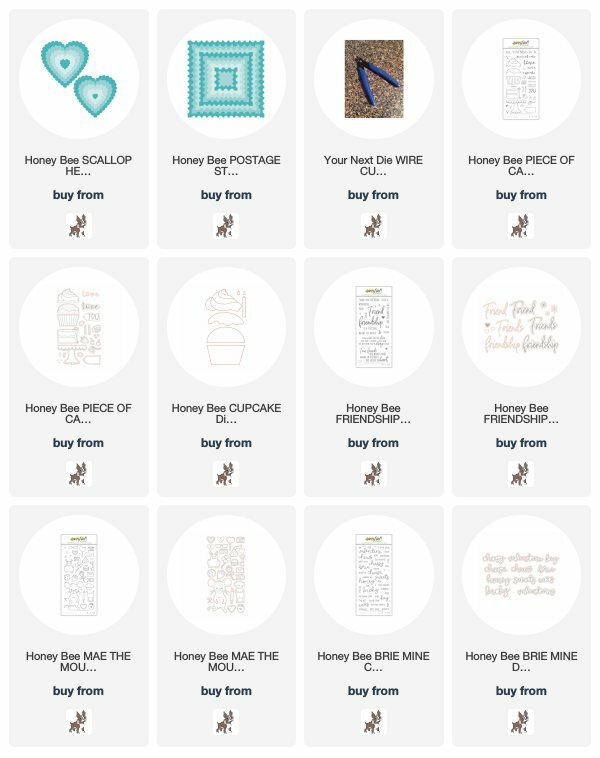 Honey Bee Stamps Brie Mine Release & Review! Hokay - last haul/Release & Review and/or Unboxing video for a little while LOL! This was the final one in my "to-do pile" and now that it's checked off I can create with a clear(er) mind. Does anyone else feel like that often? I generally have a million things swirling around in my head of things I need to do (here in my office and around the house and the kids and all that jazz) that at times it's difficult to create. I will say writing things down helps - but generally my brain is always going in a million places at once. Anywho - Honey Bee had a REALLY cute release recently. There wasn't bunch of fanfare with this one either as the hops and all will be in January (stay tuned for that as there will be tons of inspiration all at once!) but I'm kind of liking these early "surprise" releases and having some time to get myself sorted out (ESPECIALLY after the month I had). And now that I've got this out of my "to film" pile it's all in my "to use" pile (which is admittedly enormous at this point... I need more hours in the day and days in the week lol). I can't wait to ink up these stamps! You can find the entire Brie Mine Release HERE <--------click! And here are the links to everything! SO - I mentioned in a previous video that I'd be posting haul/release & review/unboxing videos basically back-to-back while I get caught up from the 2+ weeks the kids and I were sick. I'm *almost back to 100% - and compared to how I was feeling before this is a million times better lol! ANYWHO - a box showed up on my doorstep Christmas Eve and surprised me (b/c I track my orders and deliveries like a hawk since it's my job and I need to keep on top of things). I wasn't expecting this order for at LEAST another week or two. After all my complaining in 2018 about Canada Post (b/c it really was bad - not just during the strikes either - I had packages go missing that never did show up and things taking WEEKS longer than usual earlier in the year) all of a sudden they kicked it into high gear and this order shows up in under a week from being shipped out from SSS! Plus side note - I mailed out all my Christmas cards to my Patrons and whatnot - literally early last week. I've been getting messages from people telling me they've arrived. One even arrived in the UK BEFORE Christmas Day. Now THAT is impressive to get from Canada to the UK in under a week! Plus it all just reinforced why I love doing what I do when a card from me arrives and puts a smile on someone's face ❤️🙂. You can check out the whole release HERE <-------click! I created this fun winter scene using the Snow Much stamp set from the kit. I white heat embossed the igloo and one of the sentiments from the set. I then masked off the igloo and a centre rectangle and blended 3 different colors of Distress Oxide inks, then used those same inks to watercolor the igloo. I stamped the penguin with Simon's Intense Black ink and coloured him in with Copic markers before fussy cutting him out. I stamped and silver heat embossed the snowflakes from the set onto the background to finish off my scene. On the inside of the card I white heat embossed another sentiment from the set, and stamped the snowflakes with the same Oxide inks and that was it! Well I'm plugging away at getting videos filmed and posted - my office is a MESS right now with all this new stuff just laying all over the place. I have a quiet couple of days here while my kids are with their dad so the plan is to get some organizing done and possibly even get some card making time. Chris and I watched Home Alone last night - that movie is Classic Christmas for me. Do you have a fave Christmas movie that you HAVE to watch this time of year? Mine is Home Alone and Elf (which I watch with the kids usually but this year the timing is different) plus there's a few others that if I get the chance to I will watch (It's a Wonderful Life is another one). Hey everyone! Yeah......so much for my plans to post a TON of videos this week and get caught up with my Christmas card series. It just didn't happen. I ended up having to take myself and a couple of the kids to the doctor, got prescriptions for myself and one kid (and the all-clear on the other so yay for that). My sinuses are causing so much pressure that my ear has been ringing for a week. It's driving me insane. I have a prescription to help and just have to weather through it. I'm tired/ehausted (and grouchy) and all of this happening at literally the busiest time of the year just makes it hard. Anywho tho, I came (or am trying to) to terms with just ending the Christmas card series for this year. I will get comments from people telling me to keep making them throughout the year but honestly I just won't. I don't enjoy making Christmas and Holiday projects in the spring/summer etc. 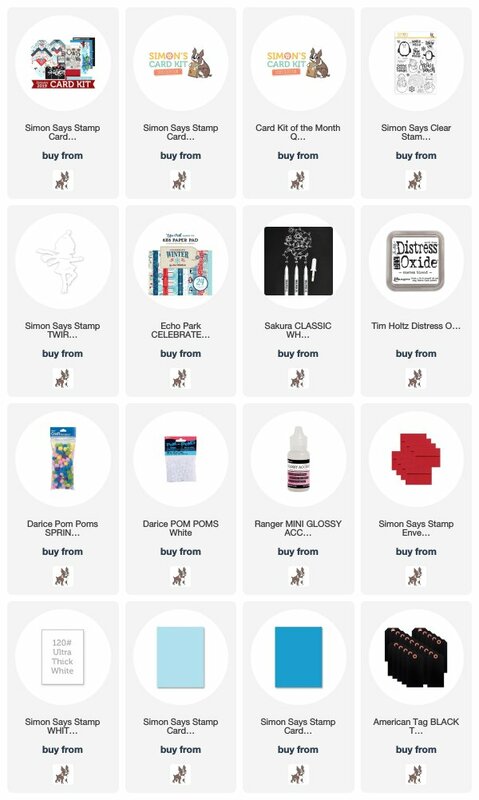 SO - I'm going to save the plethora of products I was sent and purchased (uuuggghhh I bought SO much this year it was insane) and whatever is still available (most of it should be!) next year I will start my Christmas series and use them! SO - now to keep playing catch up with other things. Simon Says Stamp's January card kit was released and is still available and it's such a fun kit! Well I'd planned to have this posted last night but every went nuts on the life end of things. I ended up chauffeuring kids to the docs office this morning and got prescriptions and meds to help as I am still battling this cold (and now have persistent ringing in my ears thanks to my sinuses being so inflamed - this has been a FUN couple of weeks.... *sarcasm*). BUT - that said almost everyone is on the mend and with the meds I'm hoping everyone that needs them here starts feeling better! I got all my Christmas cards mailed out to my Patrons and whatnot which was a bonus to all the chauffeuring this morning lol. So I am slowly but surely getting there with the catching up. The Simon Says Stamp You Are Loved Release is all available HERE <-------click! And here are the links to everything individually! Hey everyone! It's been a minute since my last post and video. I had a ton of grand plans to do all the catching up and post a ton of Christmas cards and videos leading up to Christmas. Then every single member of this household got hit with the worst cold - all the kids plus Chris and then myself got it. I still have it. It hasn't been fun. I get a lot of comments that "wow you get sick a lot" - sort of. I think because I share so much online it seems that way (plus I probably tend to whine about it a lot online lol 🤷🏻‍♀️🤦🏻‍♀️) - it doesn't help that we have 5 kids bringing home allllll the germs. I think me working from home and not getting out much just makes it so that I catch EVERYTHING they bring home. Usually it's not that bad - this one is. The poor kids had it rough and I knew EXACTLY how they felt. Anyway - they're all on the mend and I'm getting there lol! Anywho - catching up is still going to happen as I get random bursts of energy lol! Plus I used up almost my entire Christmas card stash (finally!) getting them all labelled and addressed for my Patreon supporters. So now I need to make more! And if I don't start making some now there's no way I'll get them all made for next year at that time too lol! Since today's post only makes 15 videos for my Holiday card series I'm still going to try and hit 25 like I do every year - rather ambitious to say the least with only a week left so we'll see what happens! I used Distress inks and one of my Picket Fence blending brushes to create the background with the Winter Wonder stencils. I then used white pigment ink over the larger snowfall stencil and then white gouache over the smaller snowfall stencil to complete the scene on my card base. Of course I had to pull out my all-time-favorite Honey Bee sets to finish the card - Coffee Break and Perfect Blend. The to go cups were stamped and coloured with Copics, and nestled into "snow drifts" made from glitter card stock and Honey Bee's Hill Borders wafer dies. As is a trend with me lately - this card was perfect for including a gift card with (and to be inspired by). I made a happy little discovery when I realized that one of the A2 Scallop Rectangle dies is a PERFECT sized frame for the Gift Card Slots wafer dies. Combining the two with green card stock for the inside of the card worked perfectly, and then I added sentiments from the Perfect Blend set and that was it! Hey everyone! MFT's December release went live this morning! SO many great stamps and Die-namics right? I am in LOVE with the new Beautiful Bloom stamp - it's HUGE and so perfect. I white heat embossed the Beautiful Bloom onto pale blue card stock and die cut it with the coordinating Die-namics. I used the new Hello, Beautiful stamp set with the Essential Slanted Sentiments Die-namics and the Beautiful Die-namics for my sentiments. On the inside of the card I stamped the Beautiful Bloom again and then stamped a sentiment from MFT's Anything-but-Basic Friendship stamp set with black ink and that was it! Simon Says Stamp DieCember 2018 Release & Review! Ahhhhhh OK finally got my Release & Review video filmed for Simon's DieCember Release! If you haven't checked out all those new goodies you can find them all HERE <------click!